Pipes don't come much bigger! The challenges faced by the offshore industry are typified by extreme working locations subject to low temperatures and enormous mechanical and dynamic loads. The demands made on the design and materials selected for drilling rigs and wind turbines are also correspondingly high. Sif Group B.V., of the Netherlands, is one of the most important fabricators of steel tubular elements for the construction of oil and gas platforms and the foundations of offshore wind farms. The company has for decades used heavy plates sourced from Dillinger. This also applies, for example, to the monopiles for the 150 wind turbines that make up Gemini, one of the world's largest offshore wind farms. Sif has more than 450 employees at its home site in Roermond and in Rotterdam, and is capable of producing up to 300,000 tonnes of tubular steel annually for use in offshore foundations. The company, set up in 1948 and converted to a joint-stock corporation in 2016, is a leader in welding technology and productivity, having completed more than 1,700 offshore foundations, in the form of deliveries of tubular elements for jacket fabricators or offshore wind projects. At the parent site in Roermond, tubular shell sections are produced around the clock using highly automated processes in twelve fabrication buildings housing five production lines. These sections are then joined together to make XL monopiles (large-calibre tubular elements) with diameters of up to 11 m and up to 2,000 tonnes finished weight. Offshore facilities are exposed to high static and dynamic loads generated by water, wind, waves and low temperatures. In some locations, such structures are required to reliably withstand waves of over 25 metres in height and gale-force winds gusting at up to 160 km/h or more. Requirements made on the grades of steel used for the construction of jackets, topsides and monopiles are correspondingly high. The offshore industry uses two differing groups of standards, which are selected on the basis of construction conditions. The differentiation criterion is, above all, the precise origin of the Charpy V-notch impact test specimen, which is taken either at one quarter (the EN 10025, series of standards on hot-rolled structural steels for offshore use) or at half plate thickness (the classical EN 10225 series, dealing with "Weldable structural steels for fixed offshore structures"). The origin of the samples from zones of differing solidification morphologies makes it possible to achieve differing maximum thicknesses, depending on the group of standards. Dillinger meets these offshore industry requirements with thermomechanically rolled heavy plates of up to 35 tonnes in weight, which can be supplied with maximum degrees of deformation in thicknesses of up to 150 mm in the case of structural grades and of up to 110 mm for classical offshore grades. Plates for wind turbines are generally ordered from Dillinger ready-prepared for welding, with milled edges and a coat of weldable primer to protect against corrosion. The milled edges made precisely to the customer's specifications using two large-format milling machines assure the making of significantly better welds at Sif. The company cold forms plates of Grade S355 of up to 160 mm in thickness and 4.20 m in width into cylinders or half-shells. 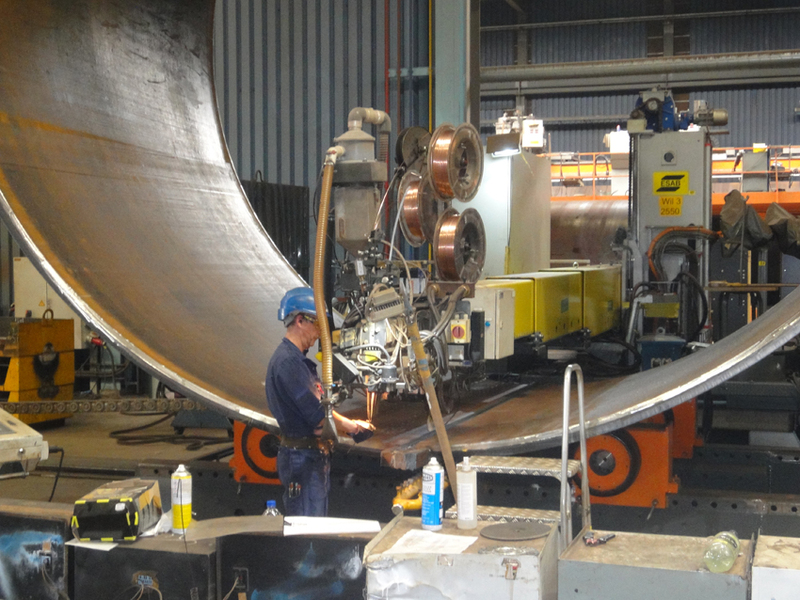 The half-shells are then welded together firstly internally, and then externally, using a longitudinal weld, to produce shell sections of a maximum weight of 70 tonnes. Circumferential welds of a diameter of 6.8 m, as needed for the monopiles of the Gemini offshore wind farm, are by no means unusual in this context. The shell sections are dimensionally and geometrically inspected after every welding operation. Assembly of the completed ring elements takes place in a parallel process: a system operator controls four welding heads, which make four circumferential welds simultaneously. Each welding head operates with four electrode wires, thus assuring an extremely high deposition rate. Sif put its trust in the outstanding quality of Dillinger's TM plates for the monopiles of the Gemini offshore wind farm. This facility is situated at one of the windiest locations off the Dutch coast, around 85 km to the north of Groningen, and occupies an area of 68 km², with water depths of up to 36 m. The 150 wind turbines installed here have rotor diameters of 130 m and a total output of 600 MW. Sif used a total of 94,500 tonnes of Grade S355ML - with individual plate weights of 32 tonnes - for the monopiles and transition pieces ordered. The length of the piles varies from 66 to 73 m, with the same diameter, depending on the exact position of the turbines in the overall field, and thus as a function of differences in the seabed or in water depth. The diameter tapers from 6.8 m for the bottom shell sections to 5.5 m at the top, on the flange, on which the tower is supported. The piles consist, in total - depending on their length - of twenty to twenty-two shell sections with wall thicknesses of up to 85 mm and a weight of up to 914 tonnes. Home > News > Pipes don't come much bigger!